Your little beardie has it made, right? He’s living the dream – you’ve got the perfect aquarium, full-spectrum lighting and a cozy heat source. Are you sure it’s diarrhea? Your beardie needs a healthy mix of plants and insects; an adult needs more vegetables than insects. Your beardie needs a healthy mix of plants and insects; an adult needs more vegetables than insects! Wild insects. I know it can be tempting sometimes, but you should NEVER feed any wild insects to your beardie. They probably have parasites and pesticides. Make sure your feeder insects live in clean, sanitary conditions. Oranges. Besides having too much water, citrus can be hard on your dragon’s little tummy. Tap water. Tap water can contain ammonia, chlorine, fluoride, and heavy metals. Treat your water with something to remove dangerous chemicals. These are usually indiscriminate – that means they remove ALL gut flora, whether good or bad! Your bearded dragon needs certain microorganisms to help digest foods and produce vitamins. Consider a probiotic treatment to help your bearded dragon recover. The basking area should be anywhere from 95 to 110 degrees. Even the cool area needs to be at least 80, and closer to 90 is better. Stress affects reptiles just like it affects us. They don’t like uncomfortable environments; this ties in with what we’ve discussed about temperature and light. Make sure your bearded dragon has a safe little place to hide; this will help him calm down and get used to his surroundings. 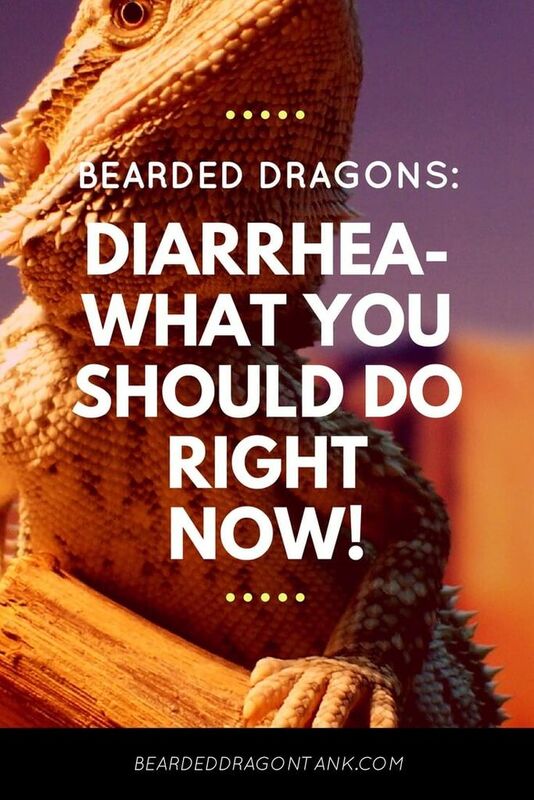 Most of the microorganisms that live in your beardie’s gut are good for him. A healthy immune system keeps them in check; but when outside factors cause his immune system to weaken (not enough food, improper lighting, unreasonable temperatures, unfamiliar situations) the more opportunistic microbes can run amok – causing serious problems. Unfortunately, these tiny little devils are invisible to the naked eye, and you’d need a microscope and a healthy education in microbiology to accurately determine which parasite it could be. The most common parasites associated with bearded dragons are coccidia, roundworms, hookworms, or pinworms. However, it could be anything, from normal food poisoning, to even the adenovirus – an especially dangerous virus common to reptiles. Consider using a //ws-na.amazon-adsystem.com/widgets/q?ServiceVersion=20070822&OneJS=1&Operation=GetAdHtml&MarketPlace=US&source=ss&ref=as_ss_li_til&ad_type=product_link&tracking_id=beadratan-20&marketplace=amazon&region=US&placement=B0002ARSLM&asins=B0002ARSLM&linkId=8089d22e11c9d7ce391a4b2127526372&show_border=true&link_opens_in_new_window=true” target=”_blank” class=”” rel=”nofollow” data-tcb-events=””>dewormer or parasite treatment. These can help clean out your beardie’s system – but remember, they’re going to clear out the good microbes along with the bad. Try a //ws-na.amazon-adsystem.com/widgets/q?ServiceVersion=20070822&OneJS=1&Operation=GetAdHtml&MarketPlace=US&source=ss&ref=as_ss_li_til&ad_type=product_link&tracking_id=beadratan-20&marketplace=amazon&region=US&placement=B00GX6NK3E&asins=B00GX6NK3E&linkId=35500be0cabb6f9d37dbb13887abe2b0&show_border=true&link_opens_in_new_window=true” target=”_blank” class=”” rel=”nofollow”>probiotic treat﻿men﻿t to follow up with.